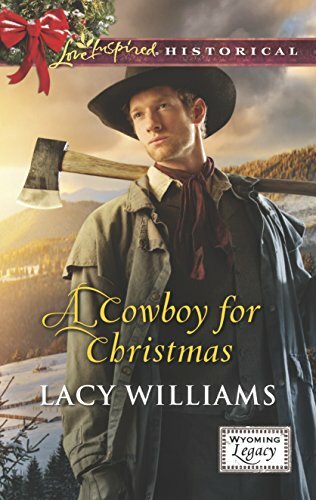 I have read Lacy Williams' entire Love Inspired Historical backlist to date. She has a way of delivering a Christian message without completely running off the rails into preaching territory. She is able to do this because she does have "pet themes." All of her books, to varying degrees, have covered things like redemption, forgiveness and fear. These fit nicely into a Christian doctrine, but are also amazingly universal. Redemption, forgiveness and fear? I defy one person who claims to have never been touched by any of those, whether or not they believe in a higher power. A Cowboy for Christmas is the latest book in the author's long-running Wyoming Legacy series, about the large White family of mostly adopted children. This is Ricky White's story, and Ricky has a lot to atone for. After a falling out in the previous book, he's in a neighboring town when a saloon fight he's involved in gets out of hand. Daisy Richards ends up as collateral damage when her wagon overturns, catches fire, and she ultimately loses her right arm. This accident has changed Daisy. She's afraid. She's a prisoner in her father's home, by her own choosing. But now her father is getting remarried (after many years of widower-hood) and Daisy finds herself saddled with two rambunctious stepbrothers and a stepmother who feels like Daisy has been coddled long enough. The girl has to start living sometime. The accident was a wake-up call for Ricky. Having spent the last several years boozing, gambling, and carousing, he is sickened by the knowledge that his actions have adversely affected someone else. He wants to atone. He wants to help Daisy. So he hires on at her father's ranch, so he can keep an eye on her, maybe help her in some small ways. What happens instead? He finds himself drawn to her. He finds himself falling for her. An added complication since she has no idea that it was his carelessness that led to the accident. Ricky and Daisy are both afraid for their own reasons. Daisy is still coming to terms with the accident. As a woman, she feels that her "worth" is now "less than." Who is going to want her now that she's lost an arm? How will she be able to take care of a household? Children? Heck, even write legibly (she was right-handed and lost her right arm). And even though she's carrying around her fair share of self-pity, she cannot abide being the object of others' pity. Which is why she has shut herself off from her friends, has refused to attend church or go to town, to essentially hide in her bedroom at her father's ranch. Some of the best emotional moments in this story are when Daisy accuses Ricky of pitying her. Ricky is afraid of not only Daisy learning the truth, but of his past in general - which he is ashamed of. There's the baggage from his childhood, the fact that he feels like he "abandoned" his family, and now Daisy. He doesn't pity her, but he does feel guilt. He has changed this woman's life and now she's a shadow. So he goes about showing her that she may have lost an arm, but she's not dead yet. Out of these moments spent together blooms a tentative friendship and ultimately, attraction. It's the attraction between the romantic couple that really struck me with this story. When inspirational romances stumble for me, this is usually where it happens. Williams has a way of keeping the romance "gentle," but not undercutting it to the point where you begin to wonder if the characters are eunuchs. I'd hardly call it steamy, but she gives their interaction some sizzle - with the looks, the inadvertent light touches, and finally - the kisses. When Ricky and Daisy kiss it's enough to make your heart swoon. Even though part of a series, I think this book stands alone very well. Ricky and Daisy have a pretty big hurdle to their happy ending, and while it's typical Romancelandia how Daisy learns the truth about Ricky (sigh - the one misstep for me), I loved that it's also the moment in the book where Ricky learns to stand up and not run. A lovely read, ideal for this time of year. It's the kind of story you want to curl up next to a fireplace with on a snowy Christmas Eve. Well, an A? aztec must get this. Miss Bates: I've enjoyed all of Williams' Love Inspired Historical books to varying degrees (grades range from A to C), but I think this is her best book to date. She does so much right here - and I think a lot of it are those "scene setters" as you describe. The opening chapter at the wedding? Really fantastic.